Nintendo and Amazon have teamed up to provide Twitch Prime Members With an extra benefit consisting of up to 12 months free of the Nintendo Switch Online service. Those who sign up for Twitch Prime will be able to get 3 months free usage of the Nintendo Switch Online service. After 60 days you can get another 9 months added, totalling 12 months. You can find out more and where to get started with free Nintendo Switch Online in the official announcement below. Twitch Prime members receive game benefits all year long, including in-game loot for some of the world’s biggest PC and console games, a selection of free PC games, a Twitch channel subscription, and more every month, plus all the benefits of Amazon Prime. SEATTLE—March 28, 2019—Twitch Prime and Nintendo are teaming up to offer Twitch Prime members up to a full year of the Nintendo Switch Online service. Starting today, Twitch Prime members can claim three free months of Nintendo Switch Online when they visit twitch.amazon.com/nintendo. After 60 days, they can come back to get another nine months of Nintendo Switch Online, for a total of 12 months. 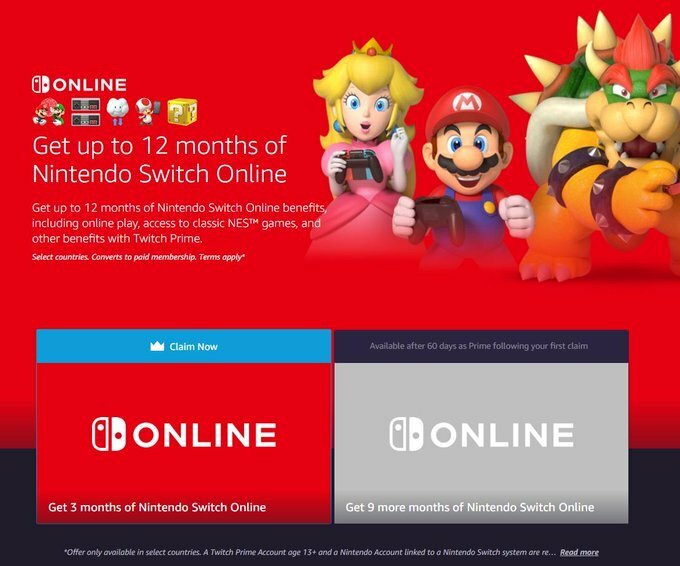 Those who already have a Nintendo Switch Online membership will have these additional months added to their existing Nintendo Switch Online membership. Twitch Prime members have until Sept. 24, 2019 to claim their three months of Nintendo Switch Online, and until January 22, 2020 to claim the additional nine months. “We’ve teamed up with Nintendo to bring members up to a full year of great experiences on Nintendo Switch,” said Ethan Evans, Vice President, Twitch Prime. “Gaming is better with Twitch Prime— members already get free PC games and in-game loot for blockbuster games, a Twitch channel subscription, and more every month, plus all the benefits of Amazon Prime. In 2018, Twitch Prime offered members more than $3,000 worth of content, including more than 70 free PC games and in-game loot in 20 blockbuster games. Plus, they enjoy all the benefits of being a Prime member—including unlimited access to award-winning movies and TV episodes with Prime Video; unlimited access to Prime Music, Prime Reading, Amazon Photos; early access to select Lightning Deals, one free pre-released book a month with Amazon First Reads, deep discounts at Whole Foods Market, and unlimited free two-day shipping on more than 100 million items. Twitch Prime members can claim their Nintendo Switch Online credit by visiting twitch.amazon.com/nintendo. To start a free trial of Twitch Prime, visit www.twitchprime.com.